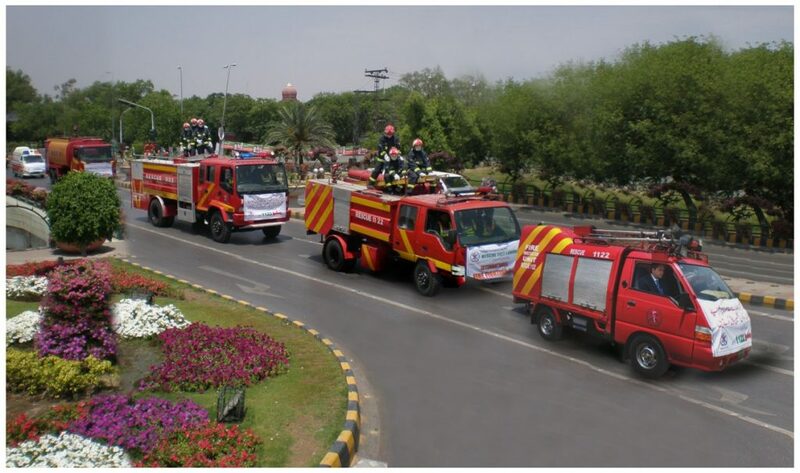 The Punjab Govt have announced Rescue 1122 Academy (Dispenser Cook Mali Driver) Jobs 2016 for the working scales in Lahore City. Applications are invited from suitable candidates for recruitment against mentioned posts in Emergency Services Academy, Rescue 1122. Audio / Video Operator, Dispenser, Tube Well & Pool Technician, Electrical Technician, Telephone Operator, Senior Office Clerk , Office Clerk, Mason, Plumber, Painter, Carpenter, Driver, Mess Cook, Life Guard, Field Worker, Cook Helper, Security Guard, Mess Attendant, Sweeper / Sanitary Worker, Office Attendant , Mali and Tower Man Flute Player in the advertisement. These jobs are free From NTS (National Testing Service. 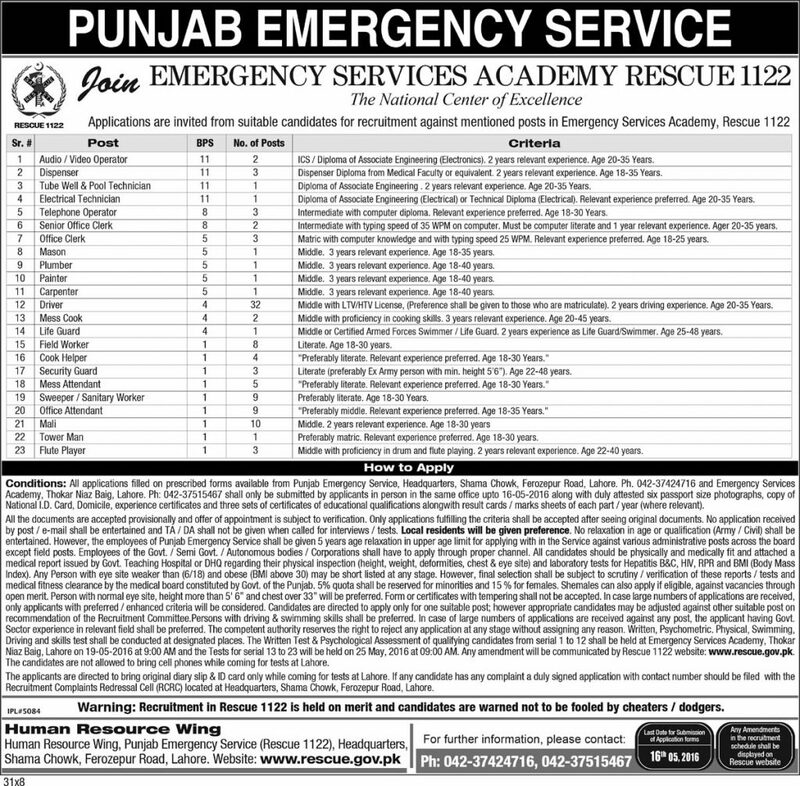 Find the complete detail of Punjab Emergency Services Rescue 1122 Academy Jobs 2016 Online in this advertisement. Term & Conditions: All applications filled on prescribed forms available from Punjab Emergency Service, Headquarters, Shama Chowk, Ferozepur Road. Lahore. Ph. 042-37424716 and Emergency Services Academy, Thokar Niaz Baig, Lahore. Ph: 042-37515467 shall only be submitted by applicants in person in the same office upto 16-05-2016 along with duly attested six passport size photographs, copy of National I.D. Card, Domicile, experience certificates and three sets of certificates of educational qualifications along with result cards / marks sheets of each part / year (where relevant). All the documents are accepted provisionally and offer of appointment is subject to verification. Only applications fulfilling the criteria shall be accepted after seeing original documents. No application received by post / e-mall shall be entertained and TA / DA shall not be given when called for interviews / tests. Local residents will be given preference. No relaxation in age or qualification (Army / Civil) shall be entertained. However, the employees of Punjab Emergency Service shall be given 5 years age relaxation in upper age limit for applying with in the Service against various administrative posts across the board except field posts. Employees of the Govt. / Semi Govt. / Autonomous bodies / Corporations shall have to apply through proper channel. All candidates should be physically and medically fit and attached a medical report Issued by Govt Teaching Hospital or DHQ regarding their physical inspection (height, weight, deformities, chest & eye site) and laboratory tests for Hepatitis B&C, HIV, RPR and BMI (Body Mass Index). Any Person with eye site weaker than (6/18) and obese (BMI above 30) may be short listed at any stage. However, final selection shall be subject to scrutiny / verification of these reports / tests and medical fitness clearance by the medical board constituted by Govt, of the Punjab. 5% quota shall be reserved for minorities and 15 % for females. The candidates are not allowed to bring cell phones while coming for tests at Lahore. The applicants are directed to bring original diary slip & ID card only while coming for tests at Lahore. If any candidate has any complaint a duly signed application with contact number should be filed with the Recruitment Complaints Redressal Cell (RCRC) located at Headquarters, Shama Chowk, Ferozepur Road, Lahore.